The downtown Kabul campaign headquarters of Dr. Abdullah Abdullah bustles with the expected frenetic activity of an election engine in the final throes of the campaign season. At lunchtime, waiters run up and down the stairs bearing massive trays of steaming pullau  the near-national dish of rice cooked with hunks of lamb, carrots and raisins  and towering stacks of flat bread to every room of the four-story building. Nearly 500 campaign workers are ensconced in this former hotel, busily counting down the handful of days before Afghanistan goes to the polls on August 20th. Once considered a long shot  in May, before the campaign season officially started, Abdullah polled merely 7% of likely voters, compared to 33% for the overwhelming favorite, incumbent President Hamid Karzai  the Abdullah campaign has rocketed from a sleepy “maybe I’ll run” to a surge in popularity garnered by saturation television and radio ads, combined with multiple election rallies. Abdullah’s rallies are unusual in a country wracked by insurgent violence. While Karzai campaigns from the lofty, army-secured heights of head of state, and another contender, former finance minister Ashraf Ghani , dominates television debates, Abdullah is taking his platform straight to the streets, or, as the case may often be, the country’s bumpy mud tracks. In a period of less than two months, the one-time warrior will have been to more than half of Afghanistan’s 34 provinces, throwing rallies under the massive, multi-colored tents usually reserved for weddings. The dangers, of course, are real. Last week, the Taliban vowed to disrupt Afghanistan’s election in a strongly worded warning posted on their website, urging Afghans to boycott the poll and “join the trenches of Jihad.” Violence has already claimed the lives of several workers campaigning for a field of 36 candidates. Abdullah has positioned himself not so much as an anti-Karzai as an alternative Karzai, offering the same promises of peace, security and stability with a new face, scrubbed clean of the corruption charges that have dogged the president’s recent tenure in power. Change and hope are Abdullah’s slogans, though like Karzai, his leadership abilities seem to be based more on personal charisma and networking than decisive problem-solving. While claiming he personally respects Karzai, Abdullah focuses on how little the president has been able to achieve in the past seven years , and promises that he will put an end to corruption and injustice. “Give me the power, so that I can return the power to you,” he declares at his rallies  a catchphrase that has become another slogan. Yet even his supporters are vague about how, exactly, he plans to fulfill those promises. Saied Hussain Fakhri, 20, a campaign worker at the Kabul office, as well as a candidate for the provincial assembly elections being held the same day, says he chose to work for Abdullah because he felt that the candidate “really supports youth on all angles.” Yet when asked how Abdullah planned to address issues of youth unemployment and educational opportunities, Fakhri had no answer. “Well, he may not have mentioned specific programs, but he definitively is a strong supporter.” The same goes for his other promises. The most concrete policy proposals Abdullah offers are a promise to move to a parliamentary system. And while the idea does have some merit in a country that would benefit from more decentralized rule, it raises the question of whether a sitting president would actually be willing to relinquish power. In an interview with TIME on the sidelines of the Panshir rally, Abdullah dismissed such skepticism: “Everybody else wants to bring more power to the presidency. What I am saying is that unless the people rule, this country cannot be ruled.” More popular still, Abdullah has promised to establish direct elections for governors and district governors rather than continue the current policy of presidential appointment. Both systems can be abused, but analysts in Kabul argue that, in Afghanistan’s young democracy, such a system would mean popularly elected governors would more than likely come from dominant ethnic and tribal groups, further alienating and abusing minorities. While Abdullah’s father is a Pashtun from Kandahar, the doctor is more often associated with the Panshir, due to his close relationship with the late Panshiri mujahedin commander Ahmad Shah Massoud, who not only helped defeat the Soviets but was also the Taliban’s most effective enemy. Massoud was assassinated, some say as a gift from al-Qaeda to the Taliban, by suicide bombers posing as TV journalists on Sept. 9, 2001. 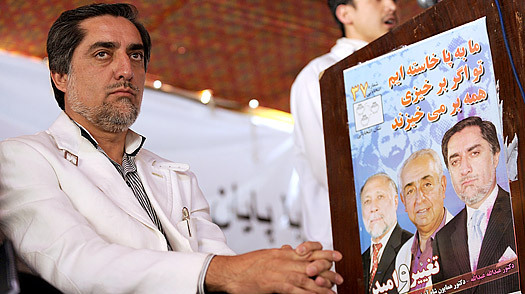 Massoud has been the cornerstone of Abdullah’s campaign: his image shadows that of Abdullah’s on many campaign posters, and before Abdullah spoke at last week’s rally, he visited Massoud’s tomb on a hilltop in Panshir. But Massoud, who is seen as a hero in large swaths of northern and eastern Afghanistan, is widely despised by the southern Pashtuns and the central Hazara ethnic groups, who suffered terrible depredations at the hands of Massoud’s army during the civil war that followed the withdrawal of the Soviets. What’s more, Abdullah is not the only former Massoud aide who can claim a connection to the hero’s legacy  Marshal Mohammad Fahim, Karzai’s running mate, was Massoud’s deputy throughout his biggest military victories. Though violence has stalked Abdullah’s campaign  a campaigner was shot and injured in an attack in nearby Laghman province while Abdullah was campaigning in Panshir  that is hardly unusual in Afghanistan: Fahim’s retinue too has been attacked, as have several aides to Ashraf Ghani. But expected violence in the country’s south may be of benefit to Abdullah. Election authorities estimate that some 700 out of 7,000 national polling stations will not be able to open on the day of elections due to violence, most in the Pashtun-dominated south where Karzai is favored, possibly depriving him of a first round victory . The possible closing of some 10% of the polls has raised fears that the elections will not be perceived as fair, particularly among Pashtuns, who make up the majority of the Taliban insurgency. The areas where Abdullah is most popular tend to be in the more stable north, where a larger turnout is expected. Abdullah, for one, is already prepared for a different kind of vote tampering. He expects fraud, he says, but assures TIME that his popularity will overcome any poll manipulation. “You can play with numbers through vote rigging or through using the state apparatus. But you cannot ignore the sentiments of the nation. Karzai doesn’t have that kind of support.” Last week, his campaign manager, Abdul Sattar Murad, told the Dubai-based National newspaper that his team would actively reject a result that had Karzai winning in the first round, saying that the only way the incumbent would get 50% of the vote would be if he resorted to “50 percent of [the corruption] he has planned.” Sattar said that Abdullah supporters would greet a Karzai victory with mass protests, and that deadly riots could break out. It was both a warning and a threat. And in a volatile country such as Afghanistan, it indicated an all too plausible scenario that could derail all of democracy’s accomplishments over the past seven years.